Some of my books have been translated into other languages, notably Portuguese, Estonian, Bulgarian and Romanian. "Reiki for Life" has now been translated into Portuguese, and as you can see from the image on the left, it is called "Reiki Para A Vida". Published by Nascente in 2012, it is already in its 3rd edition (January 2013) and it has been recommended by Joao Magalhaes, President of the Associacao Portuguese de Reiki, who said "Um livro essencial para o estudo e a pratica de Reiki em todo o seu ambito." Of course I don't know what that means, as I don't speak Portuguese, but as it is the endorsement on the front cover I'm guessing it's good! Estonian edition, and hopefully more will follow! I was delighted recently to receive a few copies of the brand new Portuguese edition of "Self-Healing with Reiki", entitled "Reiki Para Autocura". Nascente, the Portuguese publishers, brought out their edition of "Reiki for Life" (Reiki Para A Vida) a couple of years ago, and it has been doing very well, so hopefully "Reiki Para Autocura" will be just as popular. 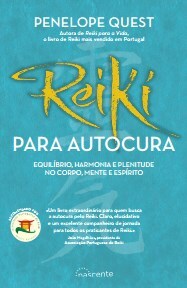 In addition, this new book has again been recommended by the Associação Portugesa de Reiki. I'll admit I don't speak much Portuguese, but even I can translate their President's comment "Um livro extraordinario" as "an extraordinary book", which is a lovely compliment!